First up we have The Harlequin's Adoration. 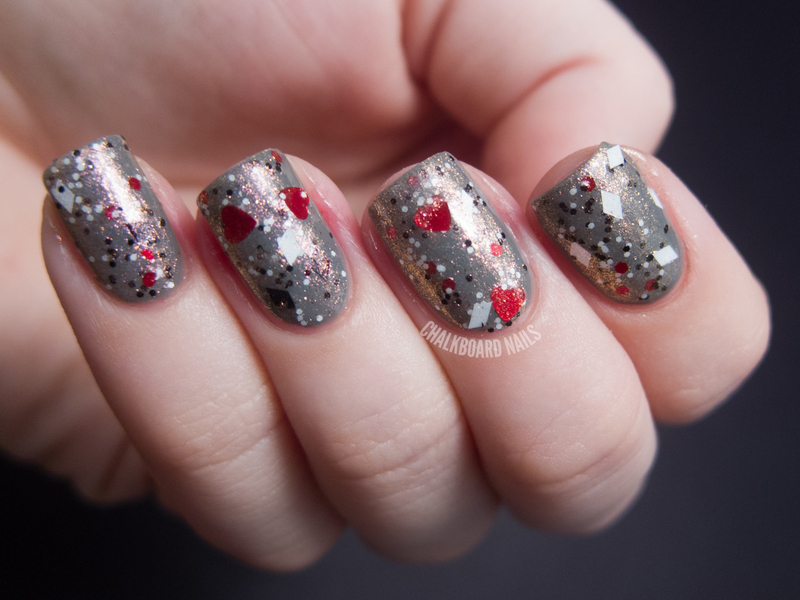 This polish is crazy packed with lots of different components! There are the large red hearts, black and white diamonds, back and white small glitter, red medium glitter, and a duochrome pink/gold shimmer. The shimmer in the base is very heavy. This is just one coat of THA over China Glaze Recycle. Since there are so many types of glitter, you are bound to end up with something interesting on each nail, be it a diamond or a heart. I recommend storing this upside down to get to the hearts more easily. Here is a photo of my nails angled to show the secondary duochrome color in the shimmery base. Next we have The Ice Queen's Lament. This polish consists of various blue, white, and silver glitters in a frosty blue base. Notable glitter shapes include silvery diamonds (you can kind of see one on my middle finger) and large blue hearts. For this look I have layered one coat over China Glaze Sea Spray. This polish is a bit trickier to work with. The frosted base shows brushstrokes easily, and it also tends to bury some of the glitters if applied unevenly. Theoretical Rockstar is a super unique polish. 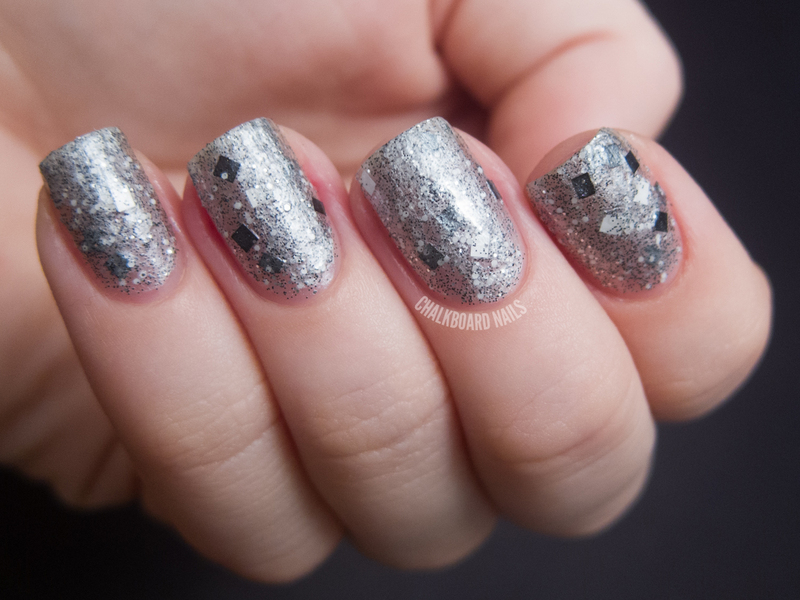 Its grey base is a cross between a shimmer and a metallic, and it is studded with lots of micro black glitter. I love the texture that the black glitter creates on this one. In addition to the awesome base, there are also white and black squares, small white, and micro silver glitters. Application can be tricky on this one too, because of the nature of the pigment used in the base. I really dig the look of this one, but I would also love to see it without the larger square glitters. I think that would really help emphasize the unique texture of the base! These photos show two coats of TR alone. Finally, we have Your Princess is In Another Castle, a pink jelly based polish with micro...flecks (I think? ), square and hex shaped pink glitters, and black hex glitters. I lost my notes sheet for this one but I am pretty sure this is three coats of this polish alone. The polish is super reflective and shiny. It's very eye catching. The black glitter makes it look like seeded watermelon. It's very juicy and definitely unique! Which one is your favorite? I really like The Harlequin's Adoration, but that shouldn't surprise you guys since it has lots of black and white glitter in it! You can find Vivid Lacquer on Etsy, where Anni also sells some custom made stamping plates (I love the honeycomb one)! Vivid Lacquer is also on Facebook. Over at Tarts n Talons she posted some on its own, as well as over a base coat. I really like Your Princess Is In Another Castle! :) Thanks for the swatches! Theoretical Rockstar is my favorite out of the bunch. I am not a fan of heart or star glitter as I always have to fiddle to get it in the brush. The last one is definitely my fav! The first one is amazing, reminds me of Alice in Wonderland! cute! the first one is my fav! beautiful! Wow, The Harlequin's Adoration is just amazing.. I'm in love! Great swatches! Oh cute! My favourites are the pink ones and the blue ones. I think the blue ones look very wintery and cute! wonderful blog!! love your nails and photos! I am new to the nail world and am your newest follower!